Alana Kadden Ballon is the co-founder and Director of Learning Programs & Business Development at Inqune. 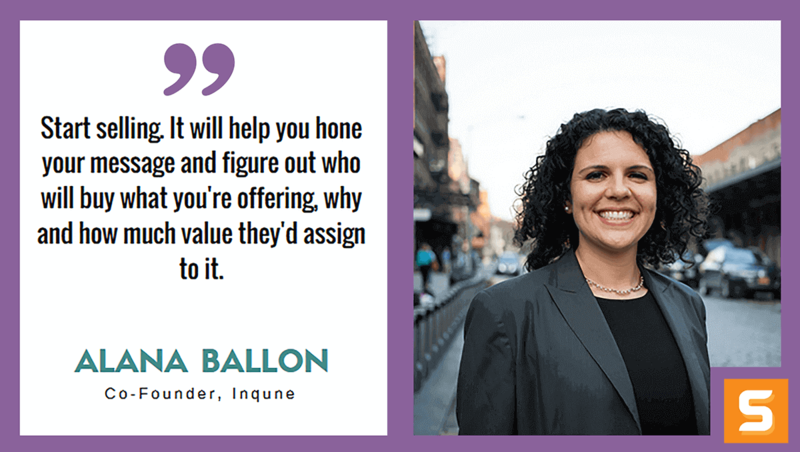 Alana leads the Inqune team to help client companies grow effectively and maximize their most valuable resource: their talent. With 10 years of cloud computing and education experience, Alana has helped cloud software leaders build learning programs that improve revenue and lift barriers to growth. Alana spent the majority of her career to date with Salesforce.com. She managed and delivered on-boarding, methodology roll-out and certification for over 1,000 sales team members worldwide before moving into sales as the founding account executive for their corporate sales team in New York City. Immediately prior to founding Inqune, Alana spent a year leading enablement efforts for Informatica’s Cloud division throughout the Eastern US, Europe, and Asia. In this interview, Alana shares how Inqune helps businesses and teams grow and scale their current processes. She notes her background in selling always has been beneficial in talking and networking and in making her business a success. Start selling. It will help you hone your message and figure out who will buy what you're offering, why and how much value they'd assign to it. What ignited the spark in you to start a business? Where did the idea for Inqune come from? For years, I had been a sales rep selling to business owners and executives and talking to them about their challenges. I wanted to more deeply understand the choices they faced. Also, I spent a lot of time on airplanes and I wanted to create a job where I didn’t have to do that and I could employ others who were looking for more control over their professional schedule as well. What makes Inqune unique? How did you find your competitive advantage? We offer as a service something companies typically need before they're ready to hire someone full-time to deliver. We focus on getting programs and learning strategies up and running quickly which is very important to our clients. There aren’t a lot of direct competitors, but when we do compete we differentiate by demonstrating how we integrate with their team and get things delivered. We’re 100% referral-based. We've gotten really good at qualifying our clients who aren’t ready to invest or who aren’t mature enough to scale their current processes. In the beginning, we were too open to small well-funded companies being asked by investors to scale, but weren’t at a point in product and messaging maturity where they could scale. We ended up scaling out the wrong messages and not having success. My biggest fear is that we're going to make a commitment that we can’t deliver on that will damage our reputation and our ability to generate business. If we do take on commitments that we can’t deliver on, it also impacts our team’s quality of life and without our team, we're nothing. Who has been your greatest influencer along your entrepreneurial journey? How did they shape Inqune? Dr. Julia Sloan, a former professor. She made me focus on what I wanted Inqune to be, how we would measure success and helped me shut out what others defined as my path. Have you faced any failures with Inqune? How did you overcome it? We haven’t faced any major failures that have haunted us. I would say our biggest failure is our inability to discontinue work with clients once they've outgrown us. We need to push our clients to hire internally when they're ready instead of holding onto us. At a certain point, they need someone internally who can drive the programs. What attitude/habits helped make you successful while starting Inqune? Discipline. We are a remote team, but I still am at my desk by 8:30 every day. My husband says that I have a very tough boss. Always be selling. I’m always talking to people in my network about our projects, our work and asking for referrals. I never get comfortable with the pipeline we have. What's the best piece of advice you've ever gotten from another business owner or someone you admired? It's hard to pick just one. I would say it's really a combination of advice from lots of people, all of whom delivered different messages. If I had to pick one, I would say Tony Rodoni from Salesforce. Long before Daniel Pink’s "To Sell is Human" came out, Tony taught me that no matter what situation you're in you're always selling. That has helped me tremendously in managing people. I’m selling them on why a project is interesting and will be successful instead of just assigning more work. We're working on several partnerships now with learning technology platforms, other consulting firms, VC and PE firms. In 5 years, I think we'll be focused on managing a portfolio of companies and driving their employee talent strategies through a network of offerings.